1935 Submarine Cables Ltd was formed by Siemens Brothers and Co and Telegraph Construction and Maintenance Co when, because of the Depression, there was insufficient work for the submarine cable divisions of the 2 companies. 1937 First cables laid between England and Holland. Stockpiling of cables for World War 2 provided a substantial amount of work. 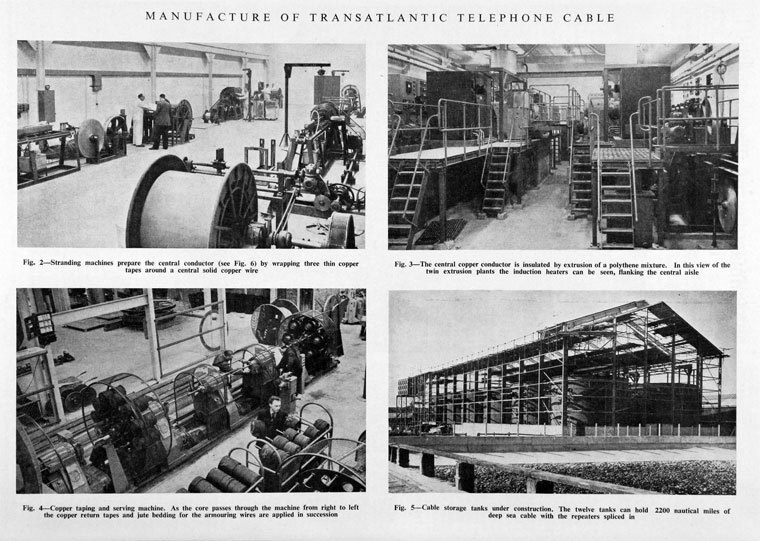 After WWII, the company was involved in the manufacture of many of the new co-axial telephone cables, much at the newly built factory at Erith. 1954 AEI purchased Siemens Brothers and Co and so acquired a 50% interest in Submarine Cables Ltd.
1959 British Insulated Callender's Cables (BICC) acquired Telegraph Construction and Maintenance Co and in so doing acquired 50% of Submarine Cables Ltd. From that date much of the submarine cable work was undertaken by Submarine Cables Ltd whilst other departments, such as power cables, were absorbed by BICC. Another section which was transferred to Submarine Cables was that which manufactured and installed cable laying equipment on cable ships. 1970 GEC sold the company to Standard Telephones and Cables Ltd. This page was last edited on 30 January 2019, at 21:07.